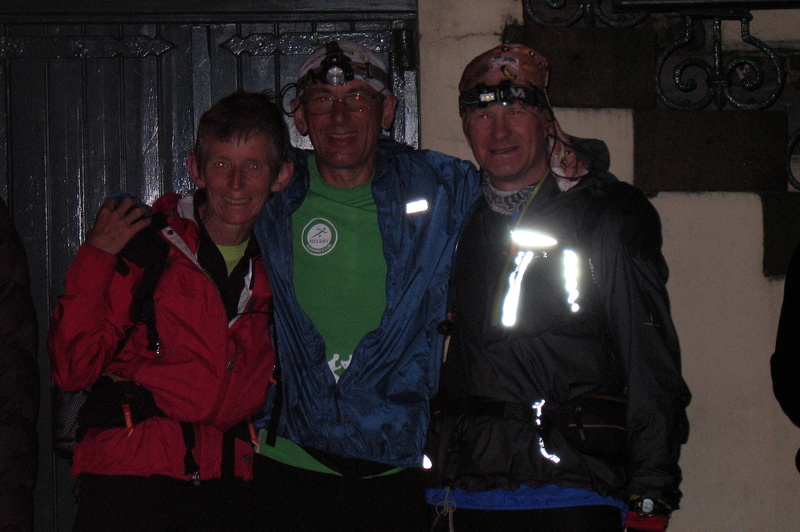 Bank Holiday Sunday saw my Mountain Marathon partner, Chris, and I getting out of our sleeping bags at 4:30am at Brotherswater in the Lakes, and driving for an hour or so to the Tan Hill Inn in North Yorkshire. We parked up in the middle of a music festival, got one of the all-night drunken revellers to take a photo of us, and set off running across the moor at 6:20. It was cold, and I’d forgotten my gloves, but who cared? This was the start of a run we had had in our diaries for the best part of a year, a challenge route from the highest pub in England to the third highest: the Kirkstone Pass Inn above Brotherswater. Ten minutes later we were out of the clouds, and for the rest of the day the weather was reasonably good to us. No more snow, or even rain, although it never did warm up. I had to keep my thermal top and fleece on all day, and even to add a windproof for the last section. We ran off the summit to join another path down to the road, then followed a 4WD track up to the next two summits, High Pike and High Seat (709m). We were going well. We took a pathless compass bearing off High Seat down to the B6259, and on the descent Chris started to have a bit of trouble with his ankle, twisted earlier on the Highlander Mountain Marathon. The next section was a long hard climb up to Wild Boar Fell (708m). On the last steep section Chris’s ankle started to give him some real trouble, and I started to worry we might not make it. We nursed it down the long slopes west to the road, and along the A683 to the Cross Keys Temperance Inn, where my family were in attendance. Chris was in so much pain by this time he had no alternative but to give up, so once we were sure he was OK I set off up the Howgills on my own. For the first time there were other people around as I headed up the Calf (676m) via the Cautley Spout waterfalls. I still felt fine as I ran up the initial valley approach then plodded up the steep steps alongside the falls. Once I was up on the Howgill ridges I was starting to feel the miles though, and the wind was cold and blowing in the wrong direction. My head started to wander and I had to concentrate to make sure I followed to right ridge along to Wind Scarth and Docker Knott. A steep descent and re-ascent to Uldale Head followed by a long steep drop to the road used up the last of my reserves. From here on it was a fight all the way. The next six miles were along a valley (Borrowdale, although not the famous one). You’d think this would feel easier, but I found it really hard to keep going, as I often do on level stretches. Under the M6 and on to cross the A6, then I met up with the family again at the bridge where the old A6 crosses Borrow Beck. A quick water stop then on into the Lakes. It’s a long approach to the true Lakeland fells from the east. The first hills, Robin Hood and Lord’s Seat, are low and rounded, but the climbs all felt hard by now, and the was no question of running any of the “up”. On to Harrop Pike (637m) and it started to feel like I was in the Lakes. Tarn Crag next (664m), the first classic Wainwright, then a pathless traverse to Gatescarth Pass and up Harter Fell (778m). A steep descent to Nan Bield Pass, where I saw the only other runner of the day, then a hard climb to Mardale Ill Bell (760m). Almost there. From here to High Street (828m, the highest point of the day) and Thornthwaite Beacon is easy. Then came the last hard bit, steeply down to Threshthwaite Mouth and a steep scramble back up to the last fell of the day, Stony Cove Pike (763m). By this time I was so close to the end I could have climbed anything though. A long ridge descent, picking off the pimple of Pike How on the way down, and I was running across the final field to the Kirkstone Pass Inn, my two daughters racing to keep up with me. And that was it. 44 miles and 11000 feet of climbing in 12 hours 45 minutes. An absolutely brilliant day out, marred only by Chris’s injury. 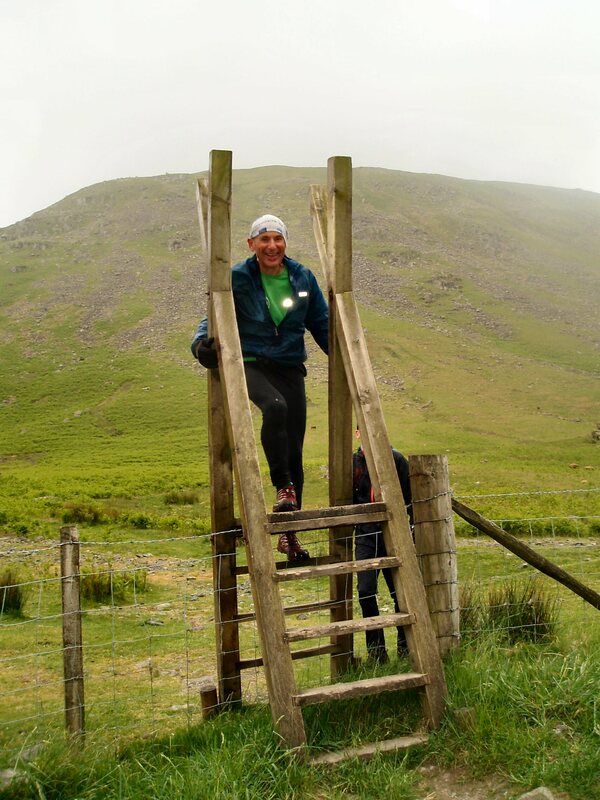 How I’m going to get myself back in fully working order in time for Saturday’s Bala trail event I’ve no idea.